Annette Celia Genevi Zilinskas was born November 6, 1964 in Van Nuys, California. At the age of 17, she already had restlessness to play and to join to a music band, in spite of not knowing how to play. In all ways, The Bangs, allowed her to enter in spite of it. According to Susanna: "She was in the same wave that us, and she wanted many to learn." It would not take a lot until they entered in a study to record 5 songs with Faulty Products. 4 of those songs were original: "The Real World", I'm in Line", Want You" and "Mary Street". The fifth were a version of "How is the Air Up There.". Annette didn't play originally in the single "Getting Out of Hand", since it was made before she joined. She incorporated when the EP was recorded. In March of 1982, the group played for the first time with Annette in a party for the magazine No-Mag, from where the came out "No-Mag Commercial." Soon after the trial arrived from a group of New Jersey about the name "The Bangs", forcing to change the name of the group or to pay 20 million dollars. With the name change to "The Bangles", changes were also made, as which was made in the credits of the song "Getting out of Hand". But with the year change, Annette decided to leave the group, the reason, Debbi summarizes it: "She wanted to be a singer and not to only be devoted to play the bass". so it was not a discharge, it was a conflict of interests. "Annete was not a good singer for our style", Vicki said, "She loves more the rockabilly music. We try to play 1 or 2 rockabilly songs so that she could sing them, but we realized that it was not our style." "She wanted to sing more", Susanna said, "Play the bass was not her passion." She decided to abandon the bass and to be centered in their solo career. 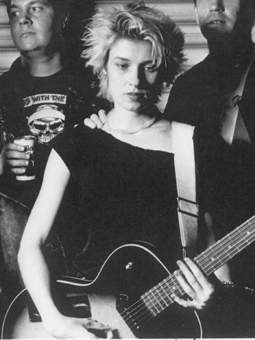 After leaving to the group, Annette joined to the cowpunk band "Blood in the Saddle", with those that would record 3 albums, "Blood in the Saddle" (1984), "Poison Love" (1986) and "Fresh Blood" (1987), before separating. Surprisingly, one of the songs, called "Into the Pines", it was written by Kurt Cobain, deceased leader of Nirvana. After the separation, Annette was jumping from group to group, the first of them called "The Ringling Sisters" that an only LP published "60 Watt Reality" in 1990. 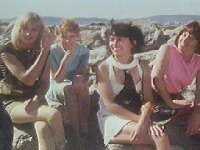 Initially the group was only formed for girls. Annette continued from group to group until forming with her boyfriend Brad Laner the group "Medicine", acting as singer, until she and her boyfriend left it, being substituted by Beth Thomson. The group had a career rather vulgar, publishing 3 albums and 2 EP from 1992 up to 1998, including a song in the movie "The Crow". although Annette didn't participate practically in the career of the group, she could hardly sing 2 songs of their premiere LP: "Shot Forth Self Living" that were "Aruca" and "Miss Drugstore." In 1994, she joined to "The Leaving Trains", group where Susanna Hoffs's brother, Jesse Hoffs was. The group took playing from 1984 and their had taken out 8 albums and 2 EP. Annette made its appearance in the album "The Big Jinx", fair before leaving the position to Charlotte Caffey. Annette continues jumping from band to band therefore, and she helped to form the group "3 Hole Punch" and to take out an album "How do you like my cat"? in 1997. One year later, she joined to "Furry Things" for their last disk "Moments Away" before they separated. From then on, Annette has not been allowed to see a lot. From time to time she appears to record with some new band again. It is said that there are many comments that she and Bangles sometimes see each other. In all ways, of all their career it is known rather little and their appearances have few.